Rookie linebacker collects most tackles in seven years for Colts. 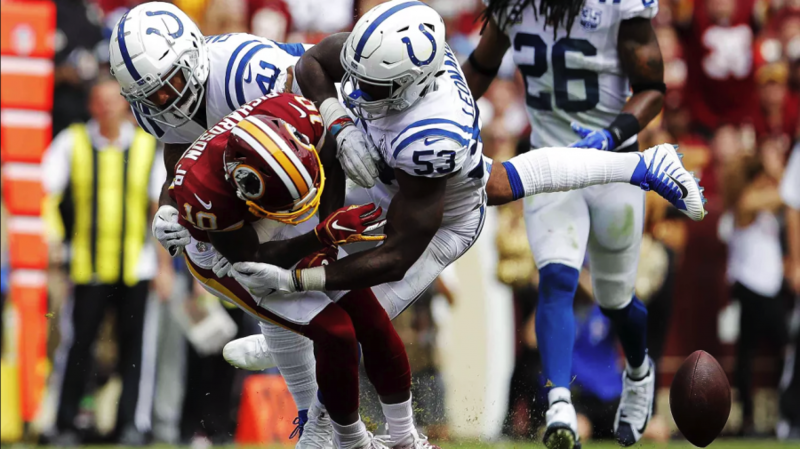 We are beyond talking about the people who doubted the Indianapolis Colts’ brain trust for drafting “small school” Darius Leonard so high. It may be time to start talking about the other teams who passed on him this spring. In just his second NFL game, the South Carolina State rookie had 18 total tackles, 15 of which were solo, in a 21-9 win against Washington. That’s the most tackles by any Colts player since 2011, and the most by any Indy rookie since 1994. Leonard who earned the nickname “Maniac” for having these type of tackling onslaughts in the MEAC has already shown his ceiling is much higher than FCS football. On Sunday he also collected a trio of firsts. His first-career sack, forced fumble and pass breakup. DARIUS LEONARD IS NOT HUMAN. Leonard had nine tackles and a fumble recovery last week in his NFL debut against the Cincinnati Bengals. Next week the Colts travel to the defending Super Bowl Champion Philadelphia Eagles. In short, our first-ever HBCU Gameday/Protect Your Skull National Defensive Player of The Year is making us all look very good!